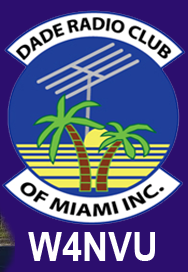 November 2010 Meeting Minutes – W4NVU – Dade Radio Club of Miami Inc.
Meeting was called to order at 19:53 with 26 present. The October Minutes were posted but not reviewed by eve. Will approve at the next meeting. Jason gave a list of minutes that are missing. Jan 2010; Mar 2010; June 2010; July 2010; Sep 2010; Dec 2009; Sep 2008 and Jan 2008. Joanne advised that these are missing either because the meeting was cancelled and there was no meeting or she was not present because of work and no one else took the minutes. Merritt spoke about the 147.000. It’s working. It’s about 4 minutes off. Ray spoke about the 145.760. Everything’s working. It has stopped announcing time. We’re on it now. Please use it. Carl spoke about the 444.200. It’s operating well. Merritt spoke about a paging system for Hams to use in an emergency and at events. The Holiday Dinner was discussed next. John Hall gave a presentation for Il Bambino Restaurant located on Bird Road and 82nd Avenue. For $18.65 per person, plus dessert, drinks, tax and tip, he read a list of entrees. We can pick any one of the listed items on the menu. He said that if you bring an unwrapped toy for $10.00 for Toys For Tots, the club will pay 50% of your dinner. He has to put down $100.00 deposit and guarantee 25 persons. A discussion took place by the membership present. Concerns were if we could come up with 25 persons in attendance at the dinner. We have had problems in the past with people saying they are going and not showing up. Dave stated that we have the money, set-up the dinner and if we have to pay, we will pay. Ernesto said that we need to have a meeting in December so we will have a very short meeting at the dinner. Philippe made a motion that we accept John’s proposal as presented for the 25 person minimum at El Bambino Restaurant at 7:30 PM ; give the $100.00 deposit for the reservation; seconded by John. After a vote, 16 were in favor. The motion carried. We will have next month’s meeting at the restaurant. Anyone who does not pay tonight and wants to go, contact John Hall at WD4SFG@bellsouth.net or at 305-226-5346. Esther gave $80.00 cash, plus John’s reservation money to equal the $100.00 deposit. He signed the menu as a receipt of the $100.00, which is attached to these minutes. Virgil then spoke about how he purchased a LDG 1800 Auto tuner. It had a problem and the company did not charge him for the repairs or shipping. They are a good company to buy from. Carl announced that he has ARPS flags for $8.00 each. See Carl to purchase a flag. Dave came into the room and announced that we have a new Tech – Ricardo Van Dordi and that last month Miguel Garate passed his Tech and tonight he upgraded to General. Congratulations Miguel. Virgil went with Robert to pick-u the equipment from the Boy Scouts. He said the he will forgo a check for reimbursement for the mileage. Virgil said that he will post a list of the equipment on South FLA Hams. Caesar introduced a friend of his that came with him tonight to the meeting, Humberto Lopez. He served 3 tours of duty in Afghanistan. Everyone thanked him for his service to our country. John asked if anyone, especially the new Hams, were interested in a soldering class. He found a kit at Hobbie Hut and if he buys 10, they will give him a discount. Dues are due. You can pay your dues tonight or mail them to: Dade Radio Club of Miami, PO Box 452253, Miami, FL 33245. It is $30.00 for membership and an additional $5.00 for each family member. Carl asked about our upcoming elections. Ernesto advised that the by-laws state that he needs to nominate a committee, which he will appoint in January and elections will take place at the February meeting. Ray brought up the ING race with Ben Nemsner for January 30. He needs volunteers. Email him. Virgin stated that the ING marathon will take place Sunday, January 30th early in the morning. Philippe advised of the Junior Orange Bowl Parade will be January 2 at 4PM. Anyone interested, see Philippe. Carl announced that one of our members, Randy, is leaving to Landenberg, Virginia. Ernesto personally thanked Randy for all of his help with our events like the Bike Tour. Randy said he has been on the net over 50 years. He moved here in 1983. He will be setting up on HF as soon as he can. Randy – you will be missed by everyone! Good luck on your move. Robert announced that Saturday, December 11 is the Boy Scout Jamboree at Joe Robbie Stadium. If anyone is available to turn on your radio that day and talk to them. He will posit it on South Fla Hams. He said the Boy Scouts have no interest in putting up anything at their headquarters as far as radio equipment. Carl will take in the equipment after the meeting to the radio room. To get on South Fla Hams you need to join Yahoo Groups. You go to SouthFlaHams.com and sign up to join. Merritt also spoke about electronic meters that FPL uses. He will bring one to the January meeting. It has an inverted antenna. If you don’t pay your bill, they can turn your electricity off remotely. There are RF issues with the meters. Ray also brought up about the baby monitors and how others can also access the feed. Ernesto asked if there was any other business. With no other business, Ernesto thanked everyone for coming. A Motion to close the meeting was made by Carl, seconded by Caesar. Voted and passed. The DRC meeting was adjourned at 21:04 and the meeting was taken off the air.